For me staying positive doesn’t mean you have to be happy all the time. It means that even on the hard days you know that better days are coming. It’s 7 AM in the morning and we are about to start day number 5. Yesterday I woke up feeling quite rested. 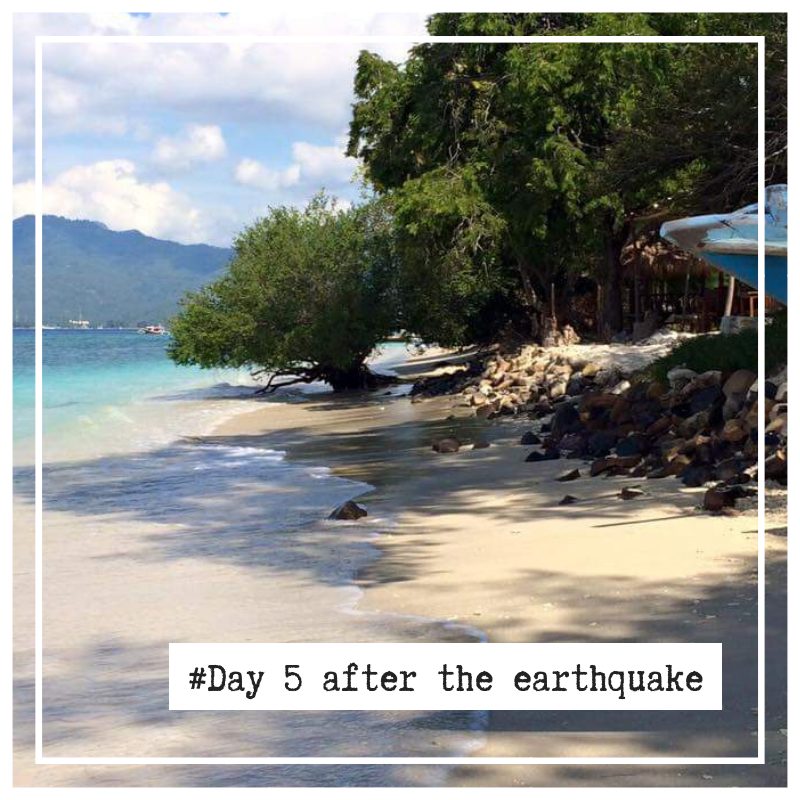 It was the first night where we didn’t had an earthquake and I slept more than 4 hours straight. We started to make plans for the day; out of the 10.000 things that needed to be done, where would we start? Besides spending a lot of time in the magical underwater world, we also love to be in the field and give back to the wonderful community of Gili Air by running a Plastic Free Paradise campaign to create awareness and reduce the use of single-use-plastic. We decide that our focus will be (besides our crowdfunding campaign) the re-opening of the Gili Shark Conservation Project. For the first time since the earthquake I opened my email and to my great surprise I didn’t find one cancellation for our program. Instead I found the opposite; my email is full of people that want to help. I feel so overwhelmed and cry out of happiness. The feeling of not being alone and having a network of people that want to help you and support you is exactly what you need in a surreal situation like this. Together with my island sister Zara we started brainstorming; when could we be up and running again? Where could the volunteers of the project stay now Villa Nangka is destroyed? And what would be the best way for us to help our lovely community of our paradise island to get back on their feet? Our good friend James from Begadang doesn’t have any damage from the earthquake and offered that our volunteers can stay in his beautiful place. A perfect solution! We checked in with our partner dive center Oceans5 and they hope to be up and running again by the start of September the latest. And while we are sitting in the field trying to get at least one of our dreams back on her feet I hear: “one, two, test, one, two test followed by a prayer.” I can’t believe it, It’s the mosque! I’ve never been so happy in my life to hear the mosque. When you live on a tiny Muslim island the sound of the mosque is a big part of your everyday life. Although I had to get used to in the beginning (as it be can quite loud) I started to love hearing the call for prayers. To hear the mosque for the first time in 4 days was for me a sign that we are on our way back to normal. We didn’t had a big earthquake in 24 hours and I thought the worst was over. To feel another big earthquake was difficult for me to deal with. Would it ever stop? How much longer do we need to stay strong? I’m so incredible grateful that I have a man next to my side who is strong for the both of us one the moments that I break down. And that we are surrounded by our like-minded island brothers and sister. We got all together, opened a bottle of wine (a big luxury for us) and slowly slowly happiness came around the corner and pushed fear away.